Bahn Mi sandwich & pickled carrots recipe | Bahn Mi sandwich & pickled carrots recipe – oh, that's tasty! 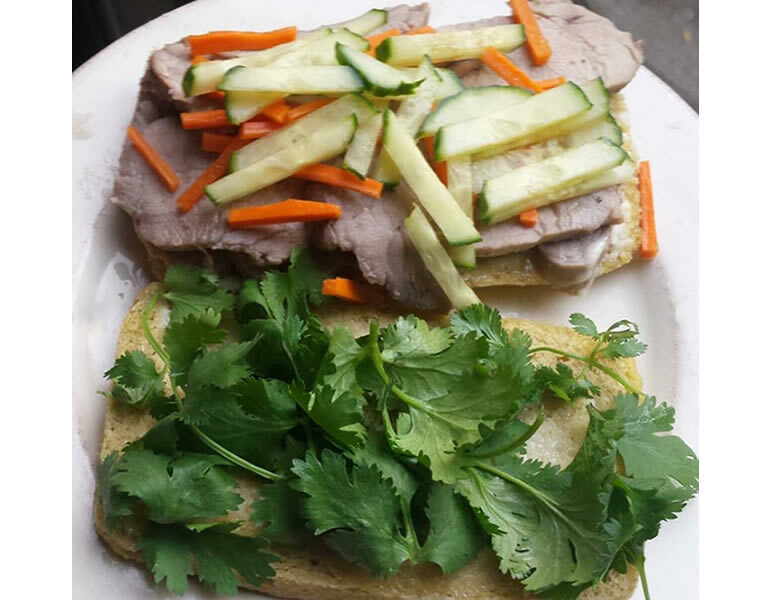 Bahn Mi is a Vietnamese sandwich with French influence. 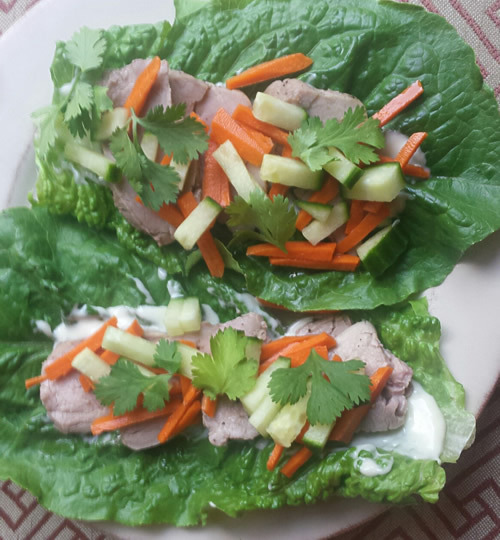 Traditionally served on a baguette, spread with mayo and sometimes pate (those are the French parts), then topped with pork or other meats (I love to use leftover pork tenderloin), cucumber, jalapeno, cilantro, and pickled carrots and/or radish. It may be hard to imagine that all these varying flavors would come together in a harmonious whole, but trust me — they do! And if you have the parts readied ahead of time, this can be an easy meal to put together quickly. With so many parts, it’s also easy to customize for individual tastes and dietary needs. Let your guests assemble their own, and they can leave out or pile on ingredients as they like. To make mine Paleo and grain/gluten-free, I like to use Romaine leaves as a wrap, instead of bread. I actually like it better that way, now! I spread the mayo first, to keep the meat juices away from the lettuce leaf. And I pile on a lot more cilantro than this picture shows. 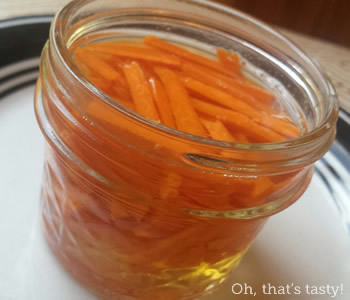 The pickled carrots are super easy, and can be made a few hours or up to a few days ahead of time. *Rice vinegar is mild flavored. If subbing a stronger vinegar, put a tablespoon or so of water in the measuring cup before filling it up with vinegar. **You could sub honey for the sugar, if you want. Use 1.5 Tablespoons instead. For strict Paleo/Whole30, omit, or replace with coconut aminos or apple juice. Stir first three ingredients till solids are dissolved. Put cut-up carrots in a half-pint jar, pour mixture in, and let marinate for one hour at least, a few would be better. Makes enough for two or three sandwiches. For the meat, use any leftover cooked pork tenderloin, pork chops, steak, or chicken. Cut it into thin slices, then reheat ever-so-briefly in some simmering broth. If you don’t have broth, use water but add a bit of soy sauce or other Asian flavoring. You basically just need to dip the meat in the simmering broth, let it sit a few seconds, turn it over, then pull it out in a few more seconds. You want to warm it up without cooking it any further, so it stays tender. Once the meat is warmed up, just lay all the ingredients out and let guests assemble their sandwiches or wraps to their liking.